OP3242. 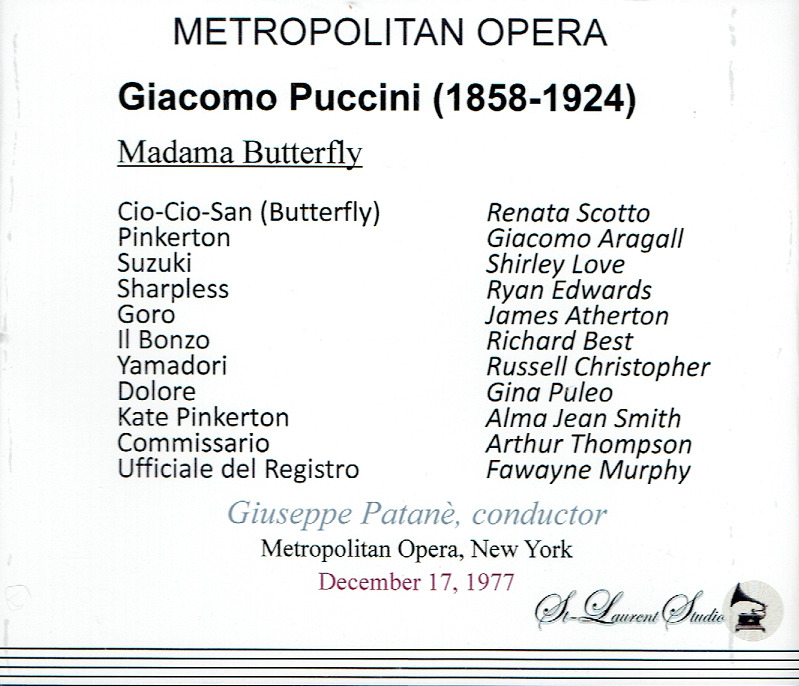 MADAMA BUTTERFLY, Live Performance, 17 Dec., 1977, w.Patane Cond. Met Opera Ensemble; Renata Scotto, Giacomo Aragall, Ryan Edwards, James Atherton, Richard Best, Russell Christopher, Alma Jean Smith, etc. [Luxury casting in that we have Giacomo Aragall as Pinkerton in one of his infrequent Met performances.] (Canada) 2-St Laurent Studio stereo YSL T-658. Transfers by Yves St Laurent. "Were I to recommend a single studio-made commercial recording of MADAMA BUTTERFLY, it would be the 1966 EMI effort with Renata Scotto and Carlo Bergonzi, lovingly conducted by John Barbirolli. 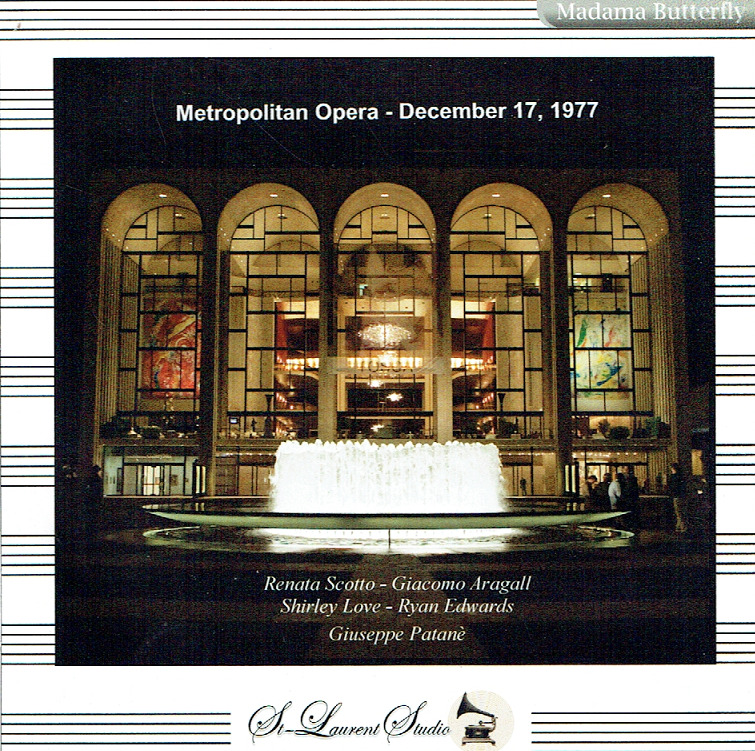 In 1978 Scotto made a second recording with Placido Domingo and led by Lorin Maazel that is curiously studio-bound, in part because of Maazel's micro-managing from the podium. A reasonable person might ask what the value is of this Met broadcast, given the many beauties of that EMI recording. Another reasonable person might respond by saying that Renata Scotto was a true stage animal, and the presence of an audience and the momentum of an actual theatrical performance inspired her to levels of intensity that are simply not present on the studio recording, as good as it is. This performance, excellently transferred by St. Laurent Studio, is as gripping and convincing as any performance of BUTTERFLY I have ever heard. This label is available at Norbeck, Peters & Ford (Norpete.com). There are so many details of Scotto's portrayal here that it would seemingly take an entire volume of FANFARE to catalogue them all. It you want to find a single moment that demonstrates vividly the greatness of this performance, go to Cio-Cio-San�s horror-filled outcry to Sharpless' 'Ah! M'ha scordata?' ('Ah! Has he forgotten me? '), a great master-stroke by Puccini, made gut-wrenching by Scotto, who practically chokes on the 'Ah' before exploding on 'scordata'. When Pinkerton's ship returns, and Butterfly experiences a brief mood of triumph and joy, Scotto's depiction of the shift from despair to ecstasy as she recognizes the ship in the harbor is filled with specifics of tone color and inflection that make the moment intensely real. At the end of the scene, her extended high A on 'Ei torna e m'ama' ('He has come back and he loves me') comes from deep within her. You hear this, and you feel that Butterfly will explode with happiness. It is singing of uncommon greatness, a level of emotional intensity we rarely hear from even the most special singers. Then the hushed, intimate tone Cio-Cio-San uses to ask Suzuki to dress her as she was on the day she met Pinkerton is yet another moment that will long stay in the memory. Scotto is also in wonderful voice here. The high D-flat at the end of her entrance is a bit wavery, but it is the only moment of less than glorious singing. Her soft singing in the little lullaby that opens the third act ('Dormi, amor mio') will take your breath away. Throughout the long conversation with Sharpless in the second act, Scotto does not casually throw away one line. Not for one measure is she an opera singer portraying a character. She is Cio-Cio-San, and we feel a woman's faith and pain deeply. Giacomo Aragall is a more than adequate Pinkerton. The Spanish tenor had a lovely timbre and an innate feeling for the shape of music like this. He doesn't possess Bergonzi's uniquely personal way of phrasing, but Aragall is a good partner for Scotto, better behaved here than he frequently was. Shirley Love is also very good as Suzuki. She was a mainstay of the Met for twenty seasons, possessing a voice of real warmth and a good sense of characterization. Suzuki here seems like a real person and a humble support for the fragile Butterfly. Ryan Edwards, like Love, was a stalwart at the Met without achieving star status, and his Sharpless is strongly drawn and well sung. His exchanges with Butterfly, perhaps inspired by the specificity of inflection of which Scotto was such a master, come to life very believably. The remainder of the cast is fine, and a lot of credit should go to conductor Giuseppe Patane. His death at 57 from a heart attack in 1989 (suffered while conducting IL BARBIERE DI SIVIGLIA in Munich) robbed us of one of the few conductors who really understood the Puccini idiom and communicated it to singers and audiences. 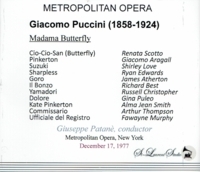 Anyone to whom MADAMA BUTTERFLY is an important work should know this performance. There is about it a dramatic truth that resonates with stunning impact." "I doubt if there is anyone with more comprehensive Madama Butterfly than Renata Scotto. That wealth of experience paid rich dividends, creating one of the most absorbing and emotional Butterflies I have seen in a very long time. Scotto's influence was obvious. I have never been so aware of the overwhelming effect of silent pauses, moments when time stood still but emotions raced ahead most obviously when Sharpless asks Butterfly what she should do should Pinkerton not return; I confess to an ache in the pit of the stomach as this Butterfly silently contemplated such a future." "Despite debilitating stage nerves and a tendency to sing under pitch, Spanish tenor Giacomo (born Jaime or, in Catalan, Jaume) Aragall forged a significant career. (He sometimes used an Italian form of his last name, Aragali, as well.) While his gifts were not always realized to their fullest due to the persistent anxiety that dogged him, his lovely, slightly smoky timbre and easy top register were heard to excellent effect in the lyric roles of his young years and in the spinto parts he assumed in his maturity. Aragall's first serious studies were with Jaime Francisco Puig in Barcelona. In view of After Aragall's stage debut (Venice, 1963 in Verdi's JERUSALEM), he appeared at La Scala as the eponymous hero in Mascagni's L'AMICO FRITZ. His La Scala debut led to the offer of a three-year contract, an occurrence that placed enormous psychological pressures on the 23-year-old tenor, introverted by nature and as yet unaccustomed to living up to high expectations. For several important debuts, Aragall was presented as the Duke of Mantua, RIGOLETTO serving as his first opera at Verona in 1965, at both Covent Garden and the Metropolitan Opera in 1968, and in San Francisco in 1973. The year following his San Francisco debut found him back in the California city for Massenet's rarely heard ESCLARMONDE, a production starring Joan Sutherland transported to the Metropolitan in 1976. A Decca/London recording preserved the work of most of the original production's cast, including Aragall as Roland. In the late '70s, nerves and distress at being apart from his family led Aragall to abandon his career for a time. Eventually, however, the desire to sing drew him back to the stage, more mature in handling career stresses and able to master a somewhat heavier repertory. Roles such as Cavaradossi, Rodolfo, Gabriele Adorno (SIMON BOCCANEGRA), Don Carlo, and Riccardo became staples along with certain French parts from earlier days, Werther, Faust, and Massenet's Des Grieux included."